A christian evangelist who predicted that the world would end on Saturday is sticking to his guns - despite getting it wrong before. 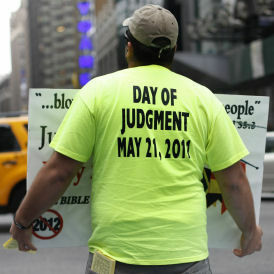 Harold Camping, the 89-year-old leader of Family Radio Worldwide, claimed Judgment Day would fall on May 21, 2012 after adding up numbers in the Bible. Mr Camping, who previously said the world would end in 1994, said in January: "Beyond the shadow of a doubt, May 21 will be the date of the Rapture and the day of judgment." The retired civil engineer, from California, is a subscriber to the belief that Jesus Christ will return to Earth to gather the faithful into heaven in a moment known as "the Rapture" - signalling the beginning of the end for the Earth. The coming of our lord Jesus Christ is not yet the end of the world, though dead in Christ shall rise first then we which are alive shall be caught up together with the risen dead. 1 Thess 4:17 Then we which are alive and remain shall be caught up together with them in the clouds, to meet the Lord in the air: and so shall we ever be with the Lord. Remember that not all dead shall rise and not all living shall be caught up in the clouds to meet the Lord in the air. Lk 17:34 I tell you, in that night there will be two men in one bed; the one will be taken, and the other will be left. Mt 24:40 Then will two be in the field; the one shall be taken, and the other left. Mt 24:41 Two women will be grinding at the mill; the one shall be taken, and the other left. Your may ask then, why is there such first and such remaining? What is the rational of it? The first resurrected will lived and reigned with Christ for a thousand years for they shall be priests of God and of Christ for the remaining lives not caught up. They will preach the gospel free from harm because they have a glorious body which cannot be subdued, killed of beheaded by nations where Christianity is entirely prohibited. Phil 3:21 Who will change our vile body, that it may be fashioned like to his glorious body, according to the working by which he is able even to subdue all things to himself. And when the gospel of Christ is preached in all nations, Satan shall be loosed out of his prison. Rev 20:8 And shall go out to deceive the nations which are in the four quarters of the earth, Gog and Magog, to gather them to battle: the number of whom is as the sand of the sea. Rev 20:9 And they went up on the breadth of the earth, and encompassed the camp of the saints, and the beloved city: and fire came down from God out of heaven, and devoured them. Rev 20:12 And I saw the dead, small and great, stand before God; and the books were opened: and another book was opened, which is the book of life: and the dead were judged out of the things which were written in the books, according to their works. Rev 20:15 And whoever was not found written in the book of life was cast into the lake of fire. For Jesus Christ must reign for a thousand years, till he hath put all enemies under his feet. 1 Cor 15:26 The last enemy that shall be destroyed is death. 1 Cor 15:28 And when all things shall be subdued to him, then shall the Son also himself be subject to him that put all things under him, that God may be all in all. What I would want to say about the impudent prediction is that, his guessed is not good enough and surely like the last, it will turn out to be a hoax again. Why not try guessing the month or the year, for it is clearly written, the day and hour are not known to any man, not even to angels in heaven, and to Christ himself. 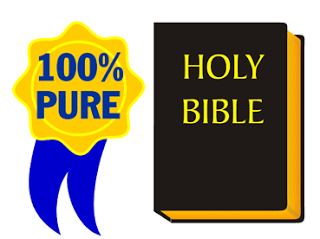 This is one of the best blog on Christianity.Thanks for sharing such bible verses. Thanks be to God. To God be the glory.